Rocking Horse #2: A Man With Some Plans! The Wood Magazine containing the rocking horse article features a pull-out section with all of the issue’s full-sized patterns. The pull-out sheet is printed on both sides, so naturally the patterns cannot just be cut out without messing others up on the backside. Irritating. My work-around for this was to lay the pull-out on a glass-top coffee table with a desk lamp pointing up from below. 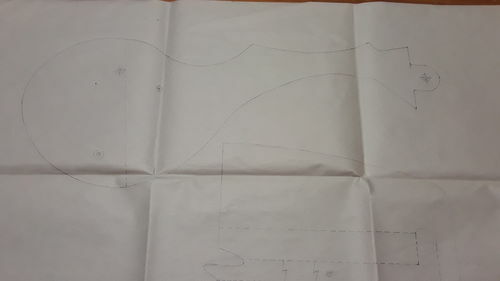 A blank sheet of tracing paper was laid on top of the pattern sheet, allowing me to transfer the drawings freehand. 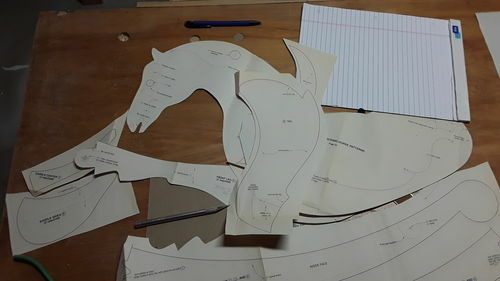 Now that all of the patterns are established, there is a lot of work to be done with an X-Acto knife to cut them out. Hey! Paul! Good to hear from you again! As far as the rocking horse, I’ve kind of been stalled the last month or so. I will be going out to purchase the necessary lumber this month. Got to get on the ball. The grand-baby is 8 months old now. I suppose I should have this done before he outgrows it! How’ve you been? What are you up to? Thanks! Good to be back among the creative folk!